Walking L Ranch - Wickenburg, AZ - Headquarters West Ltd. 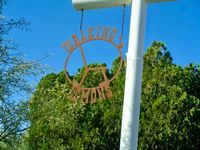 The Walking L Ranch is located north and east of Wickenburg, Arizona. The headquarters are north of downtown on Rincon Road. Constellation Rd., Blue Tank Rd. and Scenic Rd. also run through the ranch. 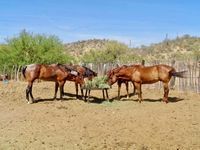 Wickenburg is a haven for team ropers and horse enthusiasts from North America. 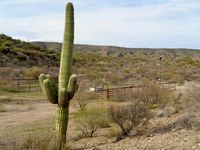 The Walking L Ranch’s 52+ square miles adjoin Wickenburg from the Hassayamapa River into the Wickenburg Mountains. The ranch originally consisted of the 10X Ranch on the south end and the Rincon Ranch on the north end. The old Rincon Dude Ranch was added to the ranch’s Headquarters by the current owner. 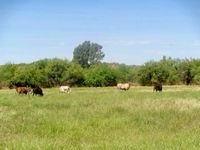 The ranch’s land tenure consists of deeded land, State and BLM Grazing Leases. Topography is rolling to steep with elevation’s ranging from 2,100’ along the river to over 2,700’ on San Domingo Peak. The ranch borders US 60 on the south side of Wickenburg. The ranch’s deeded land is in seven non-contiguous parcels throughout the ranch. The headquarters consists of 110.88 deeded acres on Rincon Road and the Hassayampa River with approximately 30 acres irrigated. Another headquarters for the 10X is on the state lease. *The Walking L Ranch is rated by the owner as historically running approximately 300 head cow/calf year round. There are seven homes throughout the ranch, most of which are in good condition. There are working pens with triggers at every water throughout the ranch. 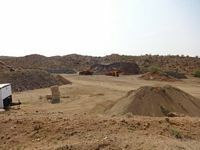 The ranch improvements are in good to excellent working condition and have been well maintained. Electric and telephone utilities are to the headquarters and adobe house deeded parcels. Water is by private wells and sewer is from septic tanks. Propane, trash and TV/internet is from private providers. Improvements at the Rincon Dude Ranch (south of the main home but also on the headquarter parcel) include a 2,200 s.f. home with three bedrooms and two bathrooms with central AC, propane gas, a large outside porch and two fireplaces. Other improvements include a cowboy house with 800 s.f. (one bedroom, one bathroom, AC and wall unit heat), barn, corrals and a five ton Howe scale. The main headquarters, including the Rincon Dude Ranch, are 2.5 miles north of downtown Wickenburg. It is located on Rincon Road 1.5 miles off of Highway 93. The Adobe House is located on 3.86 acres of deeded land 1.5 miles north of the headquarters on the west side of the Hassayampa River. It has an 1,800 s.f. three bedroom one bathroom adobe block home. It has AC cooling and wood stove for heat. 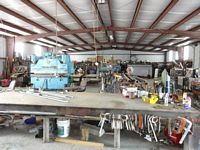 The main shop building is located on 20.66 acres of deeded land approximately 5.5 miles northeast of Wickenburg. Access is off of Constellation Road via Monarch Trail Road. 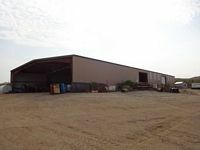 The steel shop building is 60’ wide by 150’ long with a concrete floor. Electricity is provided by a 70 kw diesel generator. Other improvements at the shop include a one bedroom one bath casita and a two bedroom two bathroom home (has solar). There are two wells on this parcel of deeded land. 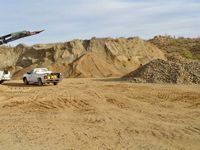 The landscape material/gravel pit is located on 41.3 acres of deeded land that is approximately 2.5 miles southeast of the shop parcel. Access is off of Constellation Road via Monarch Trail Road. 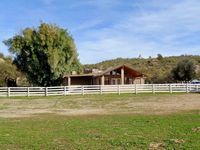 The 10X Ranch’s headquarters are located on the state lease off of Constellation Road approximately 3.5 northeast of Wickenburg. There is a 10’ x 40’ mobile home (two bedroom, one bathroom), hay barn, corrals and a five ton Howe scale. Electricity is provided by solar with a backup generator. 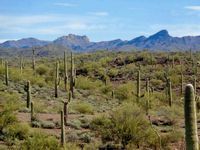 The major vegetation type on the ranch is Sonoran desert scrub. This area produces strong winter and spring annual feed when there is sufficient moisture. 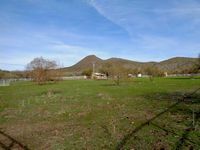 There are approximately 30 acres of pump irrigated pasture at the headquarters along the Hassayampa River. The ranch is well watered by 24 wells, springs and dirt tanks and seasonal live water. There are certificated water rights on several springs on the ranch. Domestic and irrigation water at the headquarters is pumped from wells. Depth to water is very shallow along the Hassayampa River. 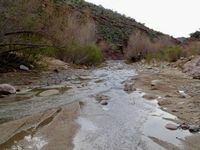 The owner reports the Hassayampa River runs year-round in the Box Canyon area. 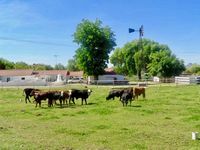 The ranch is offered with the following livestock: approximately 188 head of crossbred cows, 28-30 head of bulls, 40 head of replacement heifers and 5 head of ranch horses. The 1/3 (one third) brand #04729 is also included in the sale. Equipment included consists of: a ranch pickup, three livestock trailers, two flatbed trailers, five generators (three diesel and two propane), Massey Ferguson tractor and a disc, a Kubota 4x4 quad, two Powder River squeeze chutes, round corral with portable steel panels, round tub sorting coral, Powder River portable loading chute and two five ton scales (one located at the main headquarters and one at the 10X headquarters). The 2018 property tax bill for the 296.66 deeded acres is $8,652.58. The 2019 grazing fees for the state lease’s is $2.76/AUM and the BLM is $1.35/AUM. Based on full stocking rate, the 2018/19 property tax bill and grazing fees would be $16,732.11. C. The entire Walking L Ranch including the shop and gravel pit properties may be purchased for $4,000,000, cash (REDUCED FROM $4,500,000). Please click here to download (about 5 MB) a printable brochure in Adobe Acrobat format. If you get frustrated trying to make this work on your computer, don't hesitate to ask us to mail you a printed and bound brochure instead.